In recent years, a wide range of groups—from state and local governments to voting advocacy organizations to campaigns and parties themselves—have placed an emphasis on making it easier for people to register and vote. Prospective voters in 2008 were offered an array of channels for determining whether or not they were registered, finding out when and how to register for elections in their state, and for locating the proper polling place to cast their ballot on Election Day. Whether a voter spent most of her time on MySpace, Google Maps or barackobama.com (to name just a few of the many sites offering these services), she was likely able to access voting and registration information online. At least in part due to the success of these efforts this year’s voting period was marked by high turnout and long lines at many polling locations, and both the media (much of the early coverage on November 2 featured overhead shots of voters queuing down the block at various voting stations) and individual voters were eager to share their experiences on voting day. This communication took place in numerous ways—via in-person conversations, telephone calls or text messaging, and through online discussions over email, social networking sites, blogs or status update services. In the final part of this report, we examine the role of technology in the voting process itself. 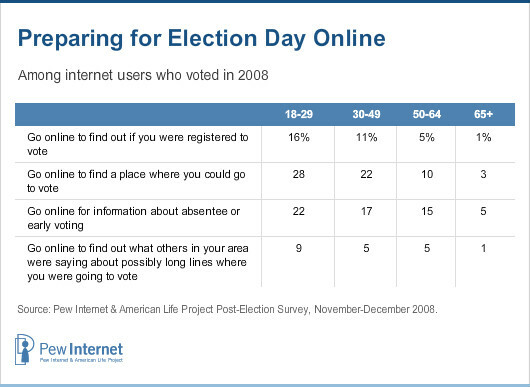 One-quarter of wired voters went online for voting information prior to casting their ballot in the 2008 election. In addition to going online prior to voting day to make sure they were registered and to get information on the logistics of voting, an additional 5% of wired voters went online to find out what people in their area were saying about possibly long lines at their polling location. First-time voters were especially proactive in going online to ensure that they were registered and aware of the location of their polling place. Fully 30% of wired first time voters went online to find out where they were supposed to vote (compared with 16% of internet users who had voted in the past) while 17% did so to find out whether or not they were registered to vote in this election (just 8% of other online voters did the same). 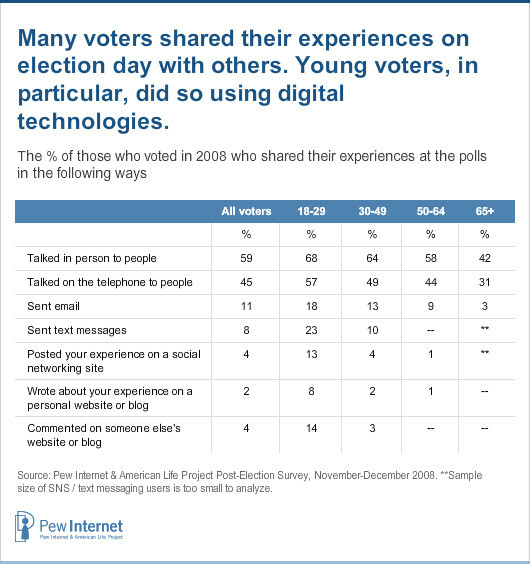 Younger internet users (many of whom voted for the first time in 2008) were also much more likely than older adults to go online for information on voting day. There is also some indication that exposure to the online political debate during the election campaign led to greater use of the internet for voting-related information. Compared with those who go online but do not use the internet for political reasons, online political users were much more likely to go online to find their voting location (22% did this, vs. 5% of non-political users); to look up information about early or absentee voting (20% vs. 2%); to find out if they were registered to vote at their current address (11% vs. 2%); and to look for information about long lines at their polling location on voting day (6% vs. 1%). Voters shared their experiences at the polls in a number of ways, both online and offline. Between the hotly contested nature of the election, extensive get-out-the-vote efforts by both parties and lengthy lines at many voting locations produced by high turnout, Election Day in 2008 was clearly a time of great excitement on the part of voters, who rushed to share their Election Day stories with their friends and neighbors through a variety of channels. Chief among these was the time-honored tradition of simply walking up and talking to people: six in ten voters (59%) said that they shared their experiences casting a ballot by talking with others in person, while nearly half (45%) picked up the telephone to tell others about their trip to the voting booth. Others used technology to share their experiences at the polls. One in five (19%) voters who use text messaging shared their experiences at the ballot box by text messaging their friends and family members; 15% of email users sent email about their day at the polls; and 14% of those who use social networking sites shared their experiences on these sites, as did 14% of Twitter users. In addition, 5% of voters who go online commented on someone else’s blog about the experience and 3% chronicled their Election Day activities in their own personal blog. As with many of the political activities discussed in this report, young adults were especially interested in discussing their experiences on voting day. This is true for all forms of communication including face-to-face and telephone interactions, but especially so for digital communications like text messaging and posting to social networking sites.